Strip steak has always been one of my favorite steak cuts. 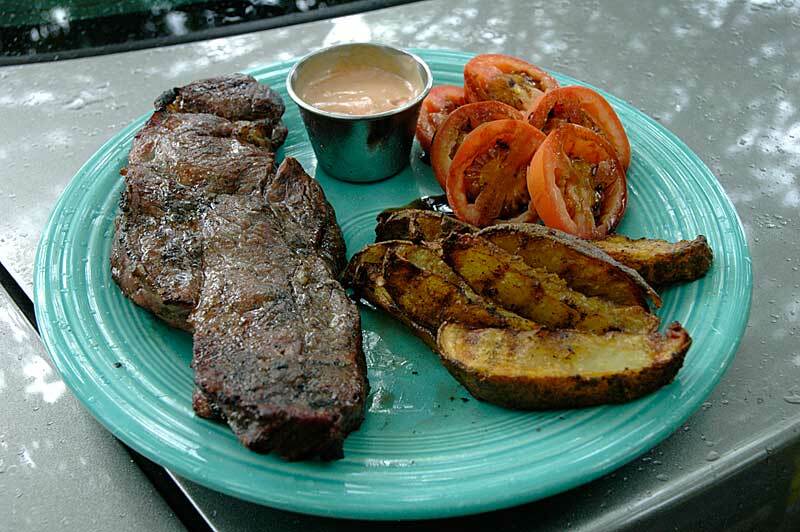 It doesn't have quite as much fat as a rib eye to eat around, it is more flavorful than a filet (tenderloin), and you can usually find them at an affordable price. 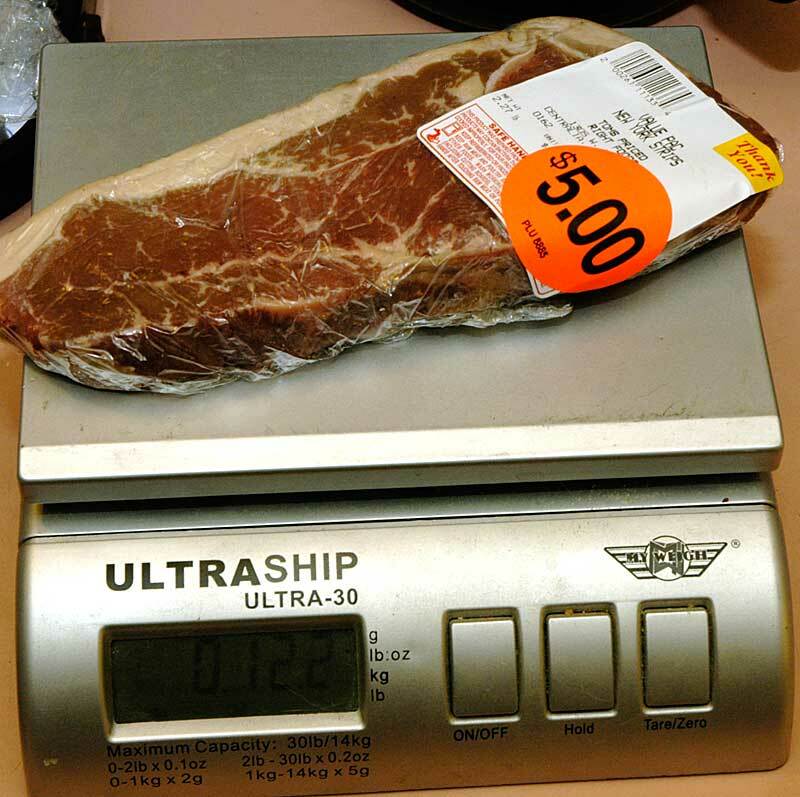 Locally I found a 2.27# pack of 3 steaks for just $5. Ideally they would have been sliced thicker but at roughly the same price I pay for ground beef, I won't complain. Here is our steak fresh out of the wrapper. I like to trim the large band of fat from the edge, give them a heavy dusting of kosher salt, some pepper, and then wrap it back up to sit for at least an hour at room temperature. 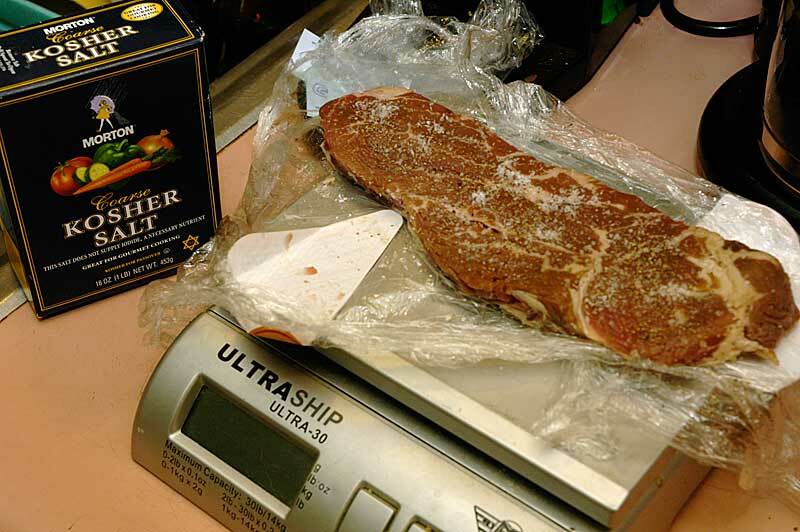 I can't stress how much better steak can be by giving it time to warm before cooking. If you salt it heavily you'll want to rise it before cooking. 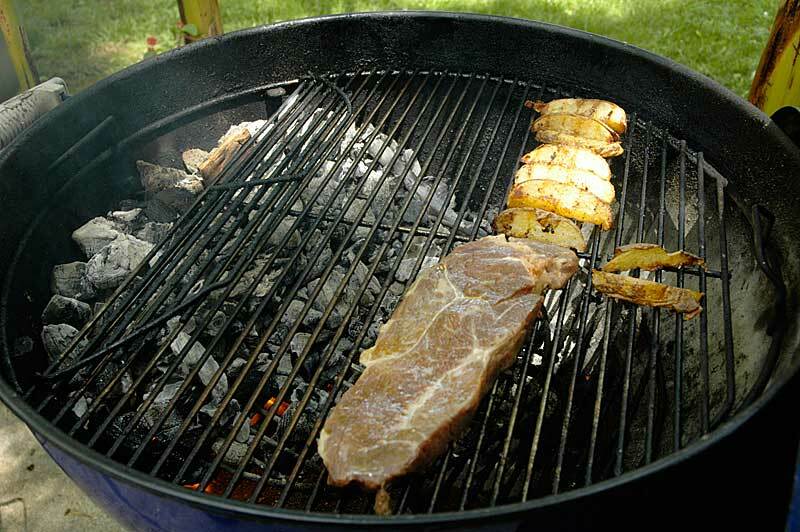 Fire up the grill with a load of lump charcoal banked on one side. I started some potato wedges earlier. I put on the steak and a chunk of hickory and closed the grill for about 8 minutes. 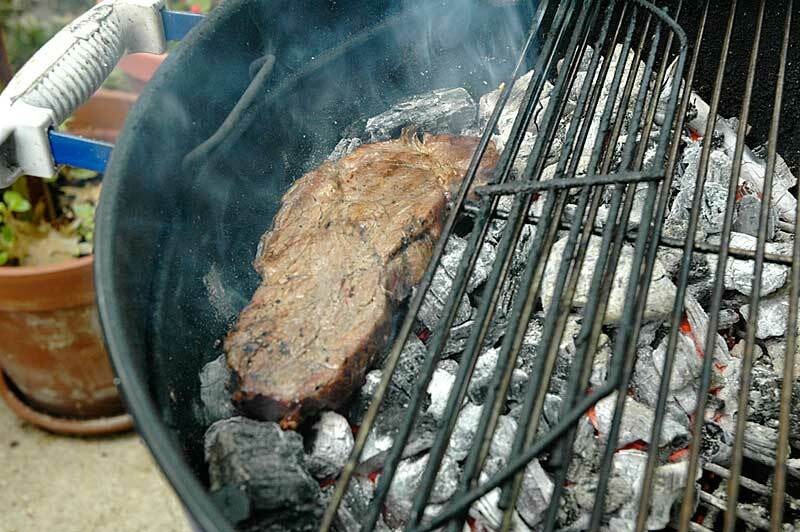 We want to give the steak a few minutes of slow cooking so it can cook more evenly and take on a nice smoke flavor. This is where practice and keeping some notes can become important. I've found that about 110 is normally where I want to finish cooking indirect, I over shot that today. I'll have to cut my sear a bit short or potentially have an over cooked steak. My target after searing is about 130-135. Time to put a sear on, or at least as good of one as is possible today. I take the lid off the grill, scoot all the food as far from the fire as possible and wait about 5 minutes for the coals to get red hot. 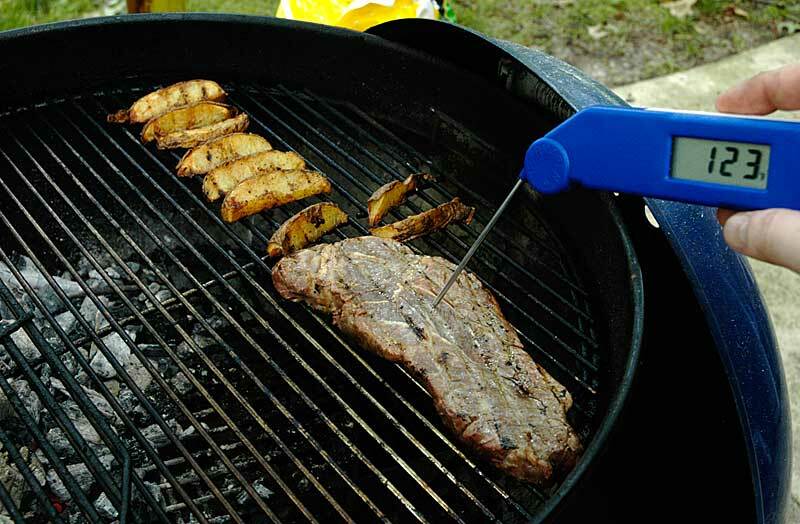 When they do, I flip up the access grate and place the steak directly on the red hot coals. I would only this with lump charcoal, with others you could still sear on the grate directly above the coals, it will just be a little cooler. 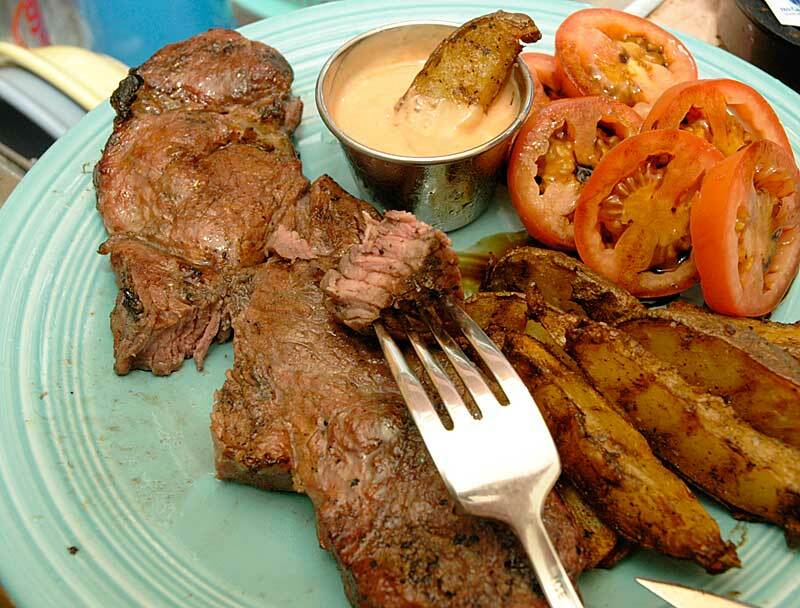 I plated my steak with some potato wedges, tomatoes slices with a balsamic vinegar reduction (that the rain promptly washed off), and a small cup of fry sauce. I had to take the money shot indoors since the rain started just as I was pulling everything from the grill. The steak is cooked a little more than I'd prefer and I wasn't able to put a great sear on it because I didn't watch the indirect cooking phase closely enough. It was still tender and delicious.